An artist's rendition of the Polercoaster. An innovative roller coaster that will send thrill seekers around a large tower along the Atlantic City boardwalk is one step closer to reality. The New Jersey Economic Development Authority approved Thursday $38.4 million in grants to help pay for a 350-foot-high vertical Polercoaster, The Press of Atlantic City reports. The funding will come in the form of tax breaks for the developer, ACB Ownership. Overall, the project is projected to cost $138 million and would occupy space where the Sands Casino once stood. The area is area bordered Dr. Martin Luther King Jr. Boulevard, and Mount Vernon and Kentucky Avenues. The 52,000-square-foot attraction will also host a bar and restaurant, a food court, retail shops and video games. The Polercoaster, designed by U.S. Thrill Rides, transforms a traditional roller coaster design into a vertical amusement ride. The track hugs an observation tower and features loops, dips and twists. 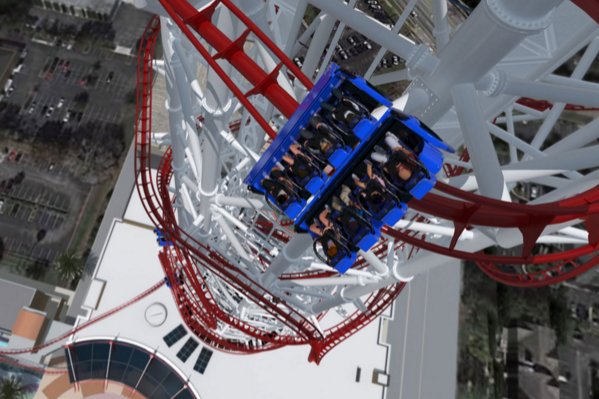 Introduced in 2012, no coasters are operational yet but five are currently in development. In Atlantic City, construction is expected to begin next month and completed in summer 2019.